NHS services in England are facing a "mission impossible" to meet the standards required by the government, health bosses say. The warning has been made by NHS Providers, which represents hospital, mental health and ambulance trusts. It said front-line services simply do not have enough money - and predicts longer waits for hospital operations and more delays in A&E as a result. But ministers said the NHS has been given the money it needs. The NHS budget is increasing this Parliament, but not by as much as the health service has traditionally got. NHS Providers predicts its members, which account for nearly two-thirds of health spending, will get £89.1bn in 2017-18 - that is 2.6% more than they got this year, but crucially just half of the 5.2% demand is expected to grow by. Chief executive Chris Hopson said it was time for the government to "sit up and listen". He described the goals for next year - to get back to hitting the waiting time targets for A&E and hospital operations, while balancing the budget - as "mission impossible". "NHS trusts will strain every sinew to deliver the commitments made for the health service. But we now have a body of evidence showing that, with resources available, the NHS can no longer deliver what the NHS constitution requires of it. "We fear that patient safety is increasingly at risk." The analysis carried out by NHS Providers predicts that the numbers waiting in A&E longer than the four-hour target will increase by 40% next year to 1.8m, while the numbers waiting beyond the 18-week target for routine treatments, such as knee and hip operations, will go up by 150% to around 100,000. 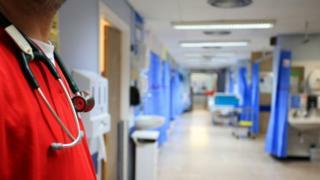 A Department of Health spokeswoman said extra money was being invested in the NHS and pointed out the Budget had set aside more funding for social care, which would also help relieve the pressures on hospitals in particular. She added the government had a "strong plan to improve performance" and accused NHS Providers of failing to acknowledge the steps that were being taken.